A week and a half ago, Element Adventures hosted its inaugural Triple Peak Gran Fondo. This was the first time I had organized an event of this magnitude, and I was extremely pleased with how it turned out. From the riders who came to enjoy our great country roads, to the volunteers who put in hours to support the riders, to excellent food, to the forecasted rain holding off until after everyone finished, the Fondo went near perfectly. I knew it had gone well when I received great feedback from the participants: “this is a must-do for an early-ish mile collection,” “this was the perfect time of year; it gave me something to look forward to all spring,” “the ride was very well organized,” “the riding out here is phenomenal,” “this is the best bbq I’ve ever had” were just some of the many praises riders sang after the ride. But this post is not intended just to toot my own horn on the Fondo I put together. I’d like to look into Why we Fondo. What compels a cyclist to take on a challenge such as the Triple Peak Gran Fondo? Most fondos are anywhere from 60 – 150 miles in length, often over tough terrain. The TPGF had a long route of 115 miles and 10.000 feet of elevation. Next week I’m going with a few friends to the Garret County Gran Fondo which has over 16,000 feet of elevation gain over 125 miles! These rides are not easy. So why do we do them? The simplest answer is one word: Fun! It is fun to spend the day on the bike, exploring new places, spending time with friends that came with you or that you meet on the ride. But it’s more than just fun. A fondo gives you an opportunity to challenge yourself while having a safety net. Going out and doing a century on your own is a daunting task. But with others, it becomes much more manageable. 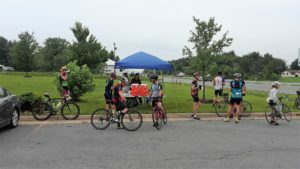 Volunteers and other riders support and encourage you; aid stations provide a place to rest and refuel, and if you really get into trouble, a course sweeper will give you a free lift back to your car. A fondo gives you the opportunity to ride new places without having to worry about getting lost: you can follow other riders, the courses are marked, cue sheets and gps files are provided. A fondo gives you the opportunity to have a “shared strong experience” with people of similar interest: it can actually strengthen your friendship with others! Of course, each individual will have their own reason for participating in a particular fondo. Some fondos are timed, basically races; many have at least a timed element, such as the three peaks on the Triple Peak. So some participants are actively trying to win a prize. For others, the prize is just finishing. Some find fondos to be good training for other events they will be doing down the road. Others choose a fondo to be the event they train all season for. 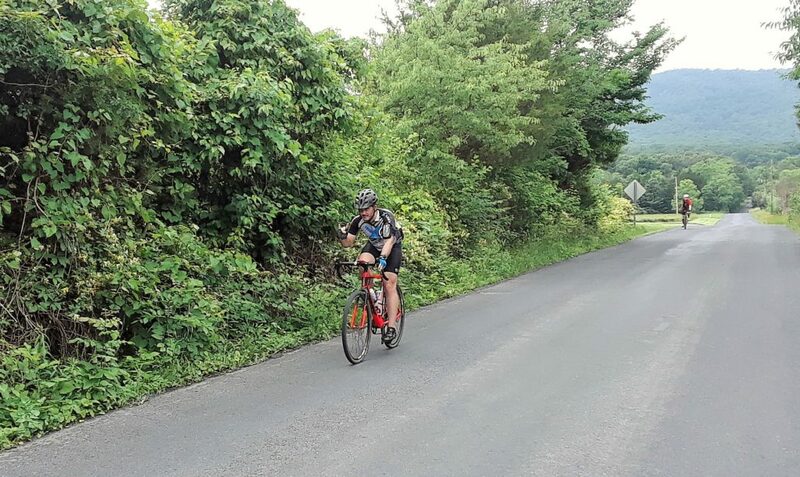 If you are not a cyclist and you are reading this post, you may ask, “How in the world can riding on a bike all day up and down steep mountain climbs be fun?” Doesn’t it hurt? Don’t you get tired? Well, yes, of course! But it’s a good kind of pain, a good kind of tired! Climbing up over Sleepy Creek (the second peak in the TPGF) is very difficult, and whichever route you chose can leave you sore afterward. But the feeling of euphoria you get when accomplishing a hard goal makes up for the difficulty getting there. I had one rider say at the rest stop at mile 95, with 20 miles left to go, “I’m actually going to finish!” It was a long, hard ride, but after getting over all three mountains, she knew she was now on the home stretch, and despite cramping and soreness, she was excited because she knew she was going to be able to complete the entire ride. Fondos are fun, challenging, and rewarding. I do hope I see you out next year at the Triple Peak Gran Fondo. Until then, there are plenty to join the rest of the season. I already mentioned Garrett County, but I’ll also be doing Jeremiah Bishop’s Alpine Loop Gran Fondo in the fall, and there are many others, as well. Some Fondos, like the Farm to Fork Fondo I provided support for a few weeks ago, even have short family-friendly routes. So whatever level of cyclist you are, you can find a fondo that will exceed your expectations of fun!